March 23, 2014 – The revival of Les Misérables opens tonight. The Divine M and I saw the final preview last night and plan to see it again (and again) during what we hope will be another long run. The re-imagined staging and computer-generated backgrounds recreate the gloominess of early 19th century France, and the show remains one of the best three-hour sermons extant. It is soul moving, profound, and — as Hugo intended — a testament of God’s subtle presence in the worst of times. I always looked forward to Bill Schmidt’s visits to The Ecumenical Center in New York, where I worked between 1995 and 2012. Bill, who often accompanied his wife, Jean, to the U.S. Office for the World Council of Churches where she was treasurer, looked like the retired church history professor he was. Tall and lanky with spiky eyebrows protruding like escaping spiders over the top of his spectacles, Bill always wore a dark suit and tie to the office. It was easy to imagine him striking an austere pose behind the podium at St. Peter’s College or New York Theological Seminary, resurrecting the ghosts of bygone ecumenical leaders. I never heard him lecture, but no doubt he was good at it. Bill would also have made a great pastor. His eyebrows would shoot up whenever he saw old friends, and his supercilious grin always assured them he was glad to see them. That may have puzzled others in the room, but I knew what he meant. The phrase was the title of a column I had written for The American Baptist magazine in 1992. It was Bill’s gracious way of telling another writer, hey, I read your stuff. A prolific writer himself, Bill must have been an insatiable reader as well. I was thinking of Bill the other day (he died in August 2009) and – wondering neurotically whether I had shown him my best rhetoric – decided to explore old volumes of The American Baptist to find and re-read the column. 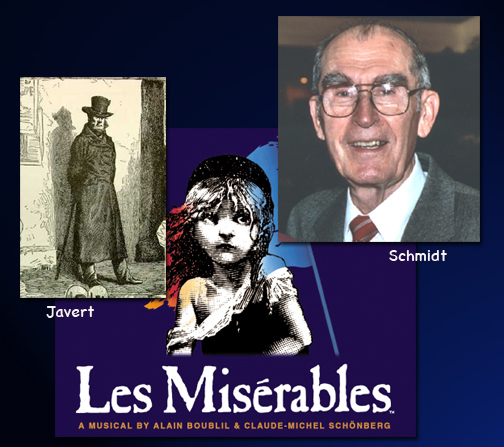 The column was actually a review of Les Misérables, the musical by Claude-Michel Schönberg with an English libretto by Herbert Kretzmer. Martha and I have seen many productions, most recently last March in Hartford. There are several love stories in both the musical and the novel, none of them more moving that the unrequited love of Éponine for Marius, who only has eyes for Cosette. Éponine loves Marius so much she is willing to give her life for him, even knowing he will never love her in return. Even Jesus doesn’t go that far. Greater love has no one than this. The original “Frauds ‘R’ Us” focused not so much on the romance of the story as the morality. Like all good literature, the characters in Les Misérables face decisions that make us all introspective, sometimes painfully so. Each year tens of thousands attend performances of Les Misérables, and it’s a good thing the theater is darkened during the show. When the dying Jean Valjean is joined by the spirits of Fantine, Éponine and all the righteous dead, eyes overflow like the cisterns of Paris. Ever since my preteen catharsis at Old Yeller, that’s the kind of thing I prefer to do in the dark. The operatic musical is based on the book by Victor Hugo. To summarize it in the way my Lit teachers never would, Jean Valjean steals bread and gets sent to a chain gang for 19 years. When Valjean is released he is inspired to live a righteous life but his criminal path is discovered by the adamant Inspector Javert,* who is determined to bring the bread bandit to justice. While trying to raise Cosette, the daughter of the ill-fated Fantine, Valjean is pursued relentlessly by Javert. There is also occasional romance and a violent revolution, neither of which is much help to Valjean. I think one of the reasons people are moved by the musical is that most of us know how Valjean feels. One does not have to be paranoid to get the feeling there is a Javert on our heels, too. David Niven (who, in my opinion, was a marvelous actor) was not alone. Most of us tend to believe we are actually frauds, and we dread the day Inspector Javert will have us arrested for pretending to be something we are not. I know the feeling. I was the least athletic member of my family, and after I grew up I tried to cover up that fact by compulsively jogging. Granted, jogging is a rather talentless process of picking ‘em up and putting ‘em down, but I hoped the grunting and sweating would obscure the fact that I am athletically inept. I was jogging in Philadelphia’s Franklin Field one morning when I was overtaken by the entire University of Pennsylvania Women’s Cross Country Team. Attempting to pay my respects to them, I ran on my toes and strained breathlessly to hold in my stomach. I lost my bearings and collided with a tackling dummy. As I lay on the grass looking up at the dummy, it appeared to be a worn, grass-stained piece of second-hand athletic equipment. Today I know better, It was my own personal Inspector Javert. “I’m sorry, old boy, but you’ve been found out,” it was saying. Actually, that anecdote is a bit of a cop-out. There are dozens of nasty little secrets in my psyche and in my past – most of them I’d just as soon not index in a national magazine. I don’t need much prompting to remind myself that I am racist or an elitist or a homophobe or a self-absorbed boor with scant sensitivity to the important people with whom I live and work. I spend a lot of time trying to improve on that, of course, but the image of innocence I project seems fraudulent to me. I must hasten to add that I don’t think this is a particularly major confession. It just places me within the mainstream of the human race. Did Javert ever catch up with Valjean? Was Valjean thrown back into a drizzly Parisian prison? Of course you know what happened. If not, Victor Hugo’s thick volume awaits you at your local library. Javert is a haunting figure because he reminds us what our lives would be like if God had not intervened. Without the Cross, all of us would be relentlessly pursued by the truth of our sins, and all of us would be condemned. Happily, there are no Javerts on our tail. God has sent Jesus to seek us out: a tireless pursuer who knows we are frauds and loves us anyway. With Javert there is only punishment. With Jesus, there is the promise that ever our fraudulence will one day be transformed for both our sake and his. * Will Swenson (Pictured above) is Javert in the current run.